RUSH: Frank, Mechanicville, New York. Welcome, sir. Great to have you with us. Hi. CALLER: Rush, thank you for having me on your show. Longtime listener. You’ve been in our family for a very, very long time in our household. Thank you. RUSH: Yeah, but don’t you get tired of it never sticking to ’em? It never sticks to them. CALLER: What’s right is right, Rush. We got keep up the good fight. RUSH: Oh, I don’t disagree. I’m not saying don’t mention it, I’m just saying temper your expectations of outrage that it’s gonna cause. 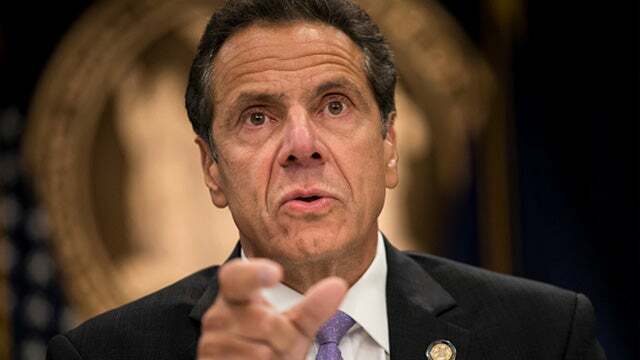 The Democrats are not gonna turn Andrew Cuomo out, and if they do it’s gonna be for another Democrat. CALLER: Unfortunately, you’re right. And you know, in this state, 13 out of 60 something counties wins these elections for these Democrats over and over again. CALLER: If there’s any example of the Electoral College and what it’s needed for, take a look at New York. Most of the state is red. RUSH: Well, a large part of is. It’s the same way with the country. Most of the country, 85% — you ready for this one? — 85%, maybe more, of the square footage or mileage of this country is red. But the population centers, the urban areas are blue. As you say, it’s a great illustration of the validity of the Electoral College. Anyway, Frank, I appreciate your call. I hadn’t heard that Cuomo cut 50 grand from Special Olympics and it ended up in his pocket. I mean, it probably didn’t directly go there, but why would you cut the Special Olympics? “Well, because we don’t have the money, Mr. Limbaugh.” Ohhh. So there are some things that you don’t have the money for? Interesting.